As of December 31, 2014, I retired from full-time teaching at HSU. While this website will remain online, it is no longer maintained. In 1452, Pope Nicholas V issued a Papal Bull - a decree that declared war against all non-Christians throughout the world and and also approved and encouraged the conquest, colonization, and exploitation of non-Christian nations and their territories. In the Bull, Pope Nicholas also decreed that Christians had the right to "capture, vanquish, and subdue the saracens, pagans, and other enemies of Christ," to "put them into perpetual slavery," and "to take all their possessions and property." (http://ili.nativeweb.org/sdrm_art.html). Thereafter, Portugal expanded its territory by making "discoveries" along the western coast of Africa and claiming those lands as Portuguese territory. Thus, in 1492, when Columbus sailed to the "New World" he did so with the clear understanding that he was authorized to "take possession" of any lands he "discovered" that were "not under the dominion of any Christian rulers." When he returned to Spain, the Spanish Pope Alexander VI issued another Papal Bull on May 3, 1493, "granting" to Spain the right to conquer the lands which Columbus had already found, as well as any lands which Spain might "discover" in the future. Pope Alexander also stated his desire that the "discovered" people be "subjugated and brought to the faith itself." When Portugal protested this concession to Spain, Pope Alexander stipulated in another Papal Bull issued in1493 that Spain could not establish control over lands which had already "come into the possession of any Christian lords." He then drew a line between the two poles, indicated that all lands discovered west of a meridian about 300 miles west of the Cape Verde Islands should belong to Spain and any new lands discovered east of that line would belong to Portugal. This papal bull also claimed that all lands already under the control of a "Christian prince" would remain under that same control. 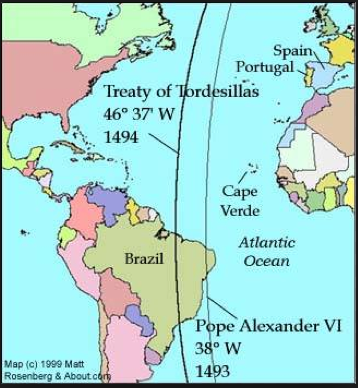 In essence, the Pope gave Spain the rights of conquest and dominion over one side of the globe, and Portugal over the other. Portugal felt their colonial impulses were limited by the line and thus King John II of Portugal negotiated with King Ferdinand and Queen Isabella of Spain to move the line to the west. King John's rationale to Ferdinand and Isabella was that the Pope's line extends all around the globe, thus limiting Spanish influence in Asia. On June 7, 1494 Spain and Portugal met at Tordesillas, Spain and signed a treaty moving the line west of Cape Verde. This new line gave Portugal more claim to South America as well as control over most of the Indian Ocean and the exclusive right to pursue trade routes around Africa. 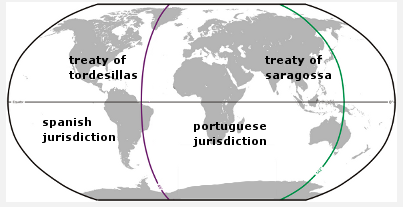 In essence, the Treaty of Tordesillas divided the world into two exploration and colonizing areas: the Spanish and the Portuguese. These divisions later became known as the Doctrine of Discovery which gave European Christians legal right to discover all lands occupied by non-Christian peoples merely by setting foot on it. A similar agreement (the Treaty of Saragossa) was later reached for a line dividing the other side of the world, such that Spain and Portugal each claimed authority over half the planet. Over 325 years later, the Doctrine of Discovery was infused into American law with the 1823 with the U.S. Supreme Court decision, Johnson v. McIntosh (8 Wheat., 543). Chief Justice John Marshall writing for the unanimous Court decision stated that Christian European nations had assumed "ultimate dominion" over the lands of America during the Age of Discovery, and that such "discovery" meant the North American Indians had lost "their rights to complete sovereignty, as independent nations," and only retained a right of "occupancy" in their lands. According to Marshall, when the United States became independent in 1776 it retained the British right of "discovery" and also acquired Britain's power of "dominion." So what does this all mean? The court denied individuals permission to buy land from American Indian tribes and instead claimed that only the sovereign United States could acquire the land, should the Indians choose to sell. Indians were given a limited right of "occupancy" without full title to their own land and could lose their land if they could not prove continuous occupancy. The doctrine explained in secular terms rather than religious terms, stating that the criterion for sovereignty meant those who were "cultivators of land" instead of "Christians."